As a conservation volunteer, Anthony lived in Ghandruk, a small mountainous village in Northern Nepal. To get there, one must travel three hours by jeep up narrow cliffside roads, followed by an hour-long hike past clouded mountain peaks. 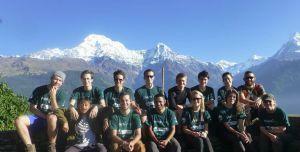 While many Kathmandu volunteers participate in care or teaching activities in the urban heart of Nepal, Projects Abroad volunteers of Ghandruk take to the wilderness on a daily basis. 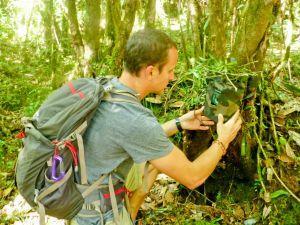 “While I was there, we did anything from bird-watching to butterfly-catching to setting camera traps for different animals,” Anthony explained. Sprinting after an Indian Red Admiral butterfly in the cool fog of a Himalayan hilltop is certainly an experience worth remembering. Even Hotel Namaste, the lodging of all volunteers in Ghandruk, faces the northern face of Machapuchre, or “fish tail” in English, a 7000 meter behemoth that rises far above the clouds. Projects Abroad hopes great stories like these inspire others to help Projects Abroad continue to make a difference, and by doing so, learn something themselves along the way.